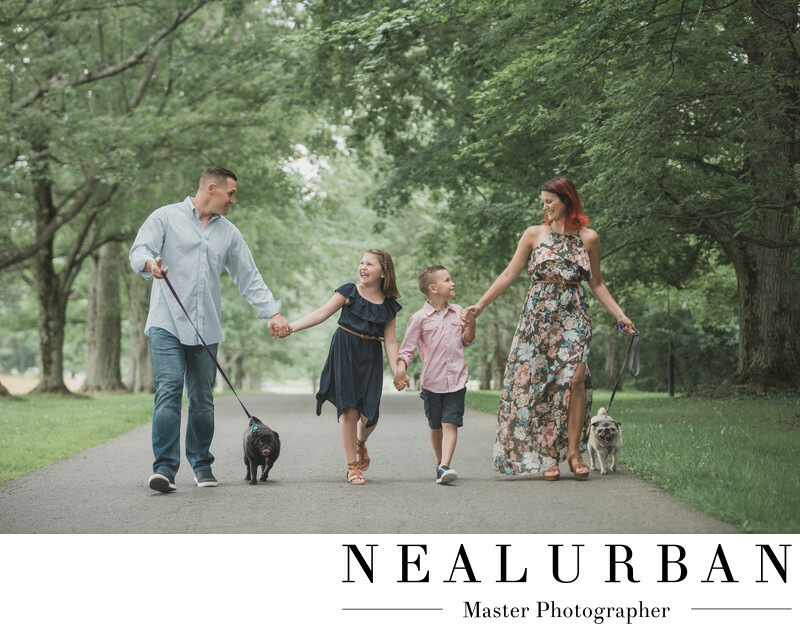 Knox Farm State Park is a great location for family portrait sessions. We also love it for maternity and engagement sessions. It is also a bonus they allow dogs. So many people want their dogs in their photos, so we have to make sure the locations are dog friendly. The Katz family wanted to bring their two pugs for photos. Mom wanted one walking image of the family and the dogs. We decided we would try and do that first because dogs are very unpredictable. It is not very easy to get the dogs where we want them to be. We always tell the family, do not pay attention to the dogs either. We will take care of that. We used one of the long roads lined with trees. We thought this would be a great scene for an action style image. We love the expressions on their faces! The kids were having so much fun. We brought our intern with us for this shoot to help with the dogs. Neal was shooting, and myself and our intern were trying to get the dogs attention. There were squeaky toys, treats, and a lot of jumping around. There were over one hundred images taken (maybe more), just to get one with both dogs in the frame and looking. We really wanted to do this without having to do a ton of post work merging multiple images together! We ended up getting a few! We loved this one best. It was an amazing joint effort on everyone's part!